My bag is usually jam packed with papers, receipts, journals, makeup and all sorts of other junk that I honestly don't need. However, I'm trying to make a change and keep the inside of my handbag clean and clear of all the unnecessary stuff I truck around town. Especially now that my new Gigi New York Spring bag has arrived. We may still have six weeks of winter ahead of us (according to Mr. Groundhog) but I'm so excited to bust out my new Mini Taylor for Aruba in a few weeks. And always with me is my 2014 day planner, my cell phone, a piece of jewelry for any unexpected night event (in this case it's this gorgeous Sheer Addiction bracelet), my favorite lip gloss, a few Vaselines, and my always about-to-explode wallet. p.s. Don't forget to take advantage of GiGi New York's and Graphic Image's winter sale where you can score 50% off some very sweet styles. Now let the countdown to Spring begin! Love that bag, it is a great size to put the essentials and then some! 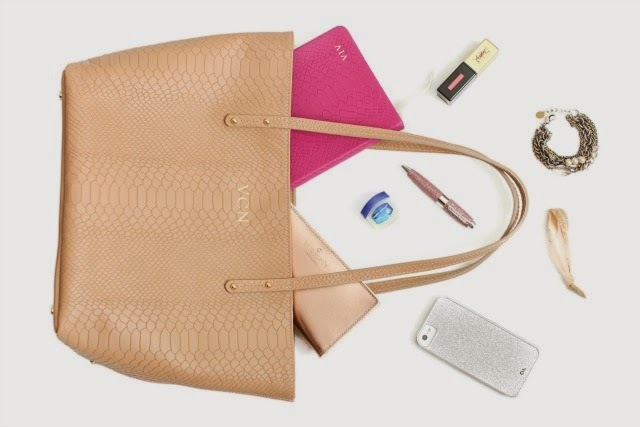 Gigi New York has the best everyday basics and essentials. Love! I just got a Gigi clutch, and I'm obsessed with it. This bag is so classic! That is the perfect tote! So pretty! Keeping a clean purse is a tough feat for me! That Gigi New York is gorgeous, definitely perfect for spring!